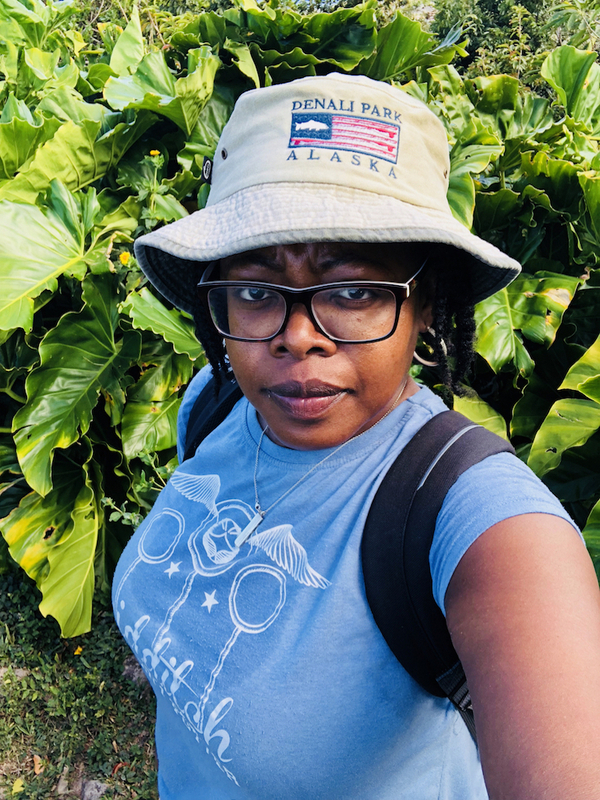 9 Nature Trails For Hiking In Montserrat - Caribbean & Co.
During my recent visit to Montserrat, I did a lot of walking and exploration of the lush green landscape. I walked partly because I didn’t have access to a rental car, also because I wanted to go at a moderate pace which would allow me to stop at will to enjoy the scenery, go off the beaten path and simply take pictures. Some thought this was rather odd since Montserrat is quite hilly and the weather scorching — also there are public buses, but I continued as I enjoy walking for fitness and would challenge myself to go further each day. 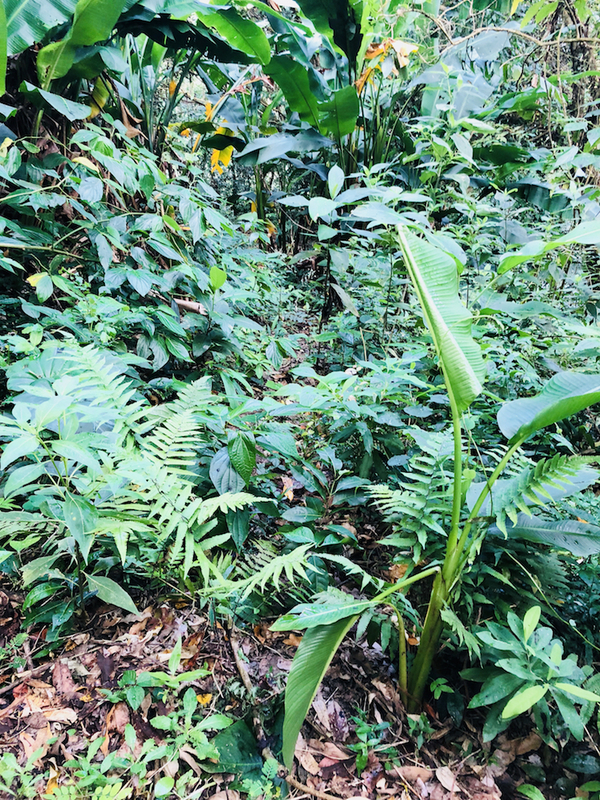 Not just on the regular roads, but also on the official nature trails for hiking in Montserrat which traverse the rainforest in the Centre Hills. The experience is so enjoyable that I consider hiking to be one of the top 10 things to do in Montserrat. Montserrat, known as the Emerald Isle of the Caribbean Caribbean due to its lush green landscape at just over 40 square miles has a wide variety of wildlife and plants. 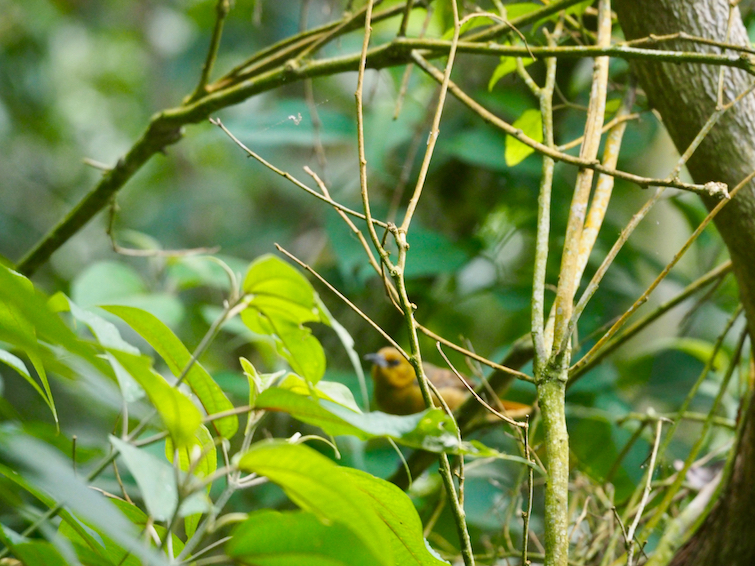 In fact, there are over one hundred bird species including the critically endangered Montserrat Oriole which is the national bird. There are also about thirteen species of reptiles and amphibians, such as the mountain chicken frog (Leptodactylus fallax) which was once a delicious delicacy, but is now critically endangered and has protected status. The mountain chicken frog, the world’s second largest frog, has this protected status due to an epidemic of chytridiomycosis which nearly wiped out the population, resulting in some being taken to the United Kingdom as part of the Mountain Chicken Recovery Program with slow reintroduction back to Montserrat. Beyond the mountain chicken frog, Montserrat also has the regular tree frog, dwarf gecko, the elusive galliwasp lizard, iguana, and the harmless Montserrat black snake (Alsophis antillensis). 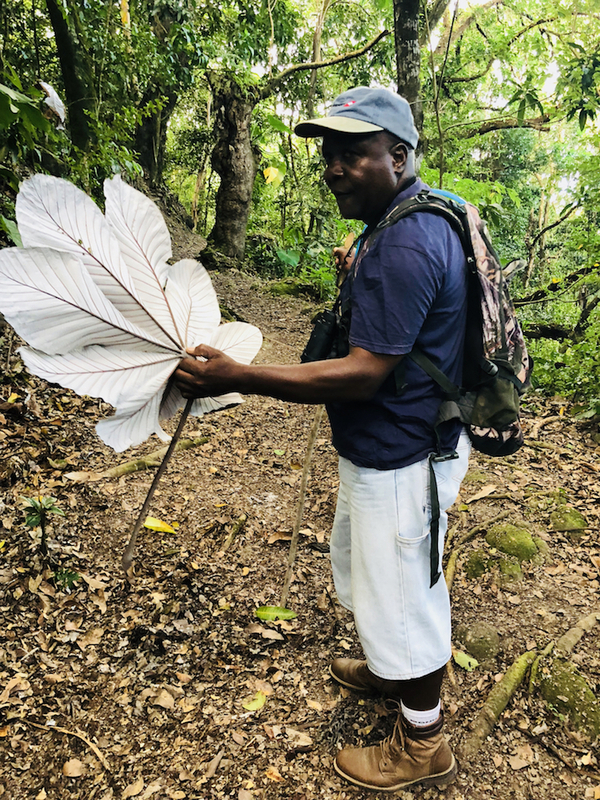 There are also about ten different native bat species to be found on Montserrat and hundreds of insect species including colorful butterflies and beetles. In addition to this diverse wildlife, Montserrat also has a wide variety of tree species including banana, cassava, cocoa. The most important are the national tree which is the hairy mango and the national flower which is the red heliconia. 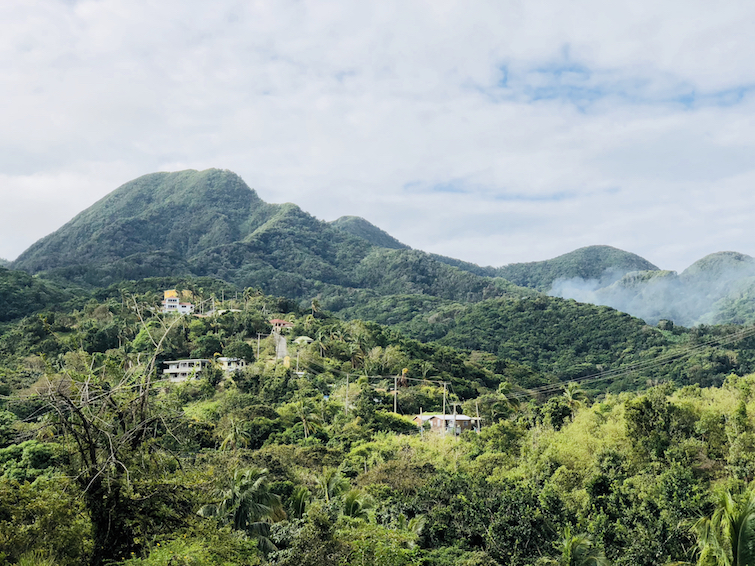 These different animals and tree species coupled with the beautiful scenery, especially from the mountain tops, makes Montserrat paradise for nature lovers. 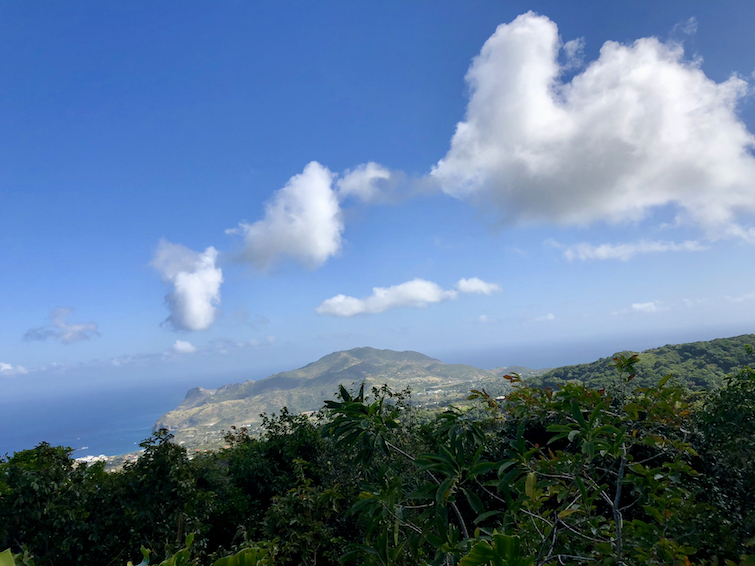 The Montserrat nature trails range from light hiking trails which is the moderate grade with flat terrain to the extreme hiking trails which are the very steep grades with uneven terrain, which might be rocky and slippery when wet. 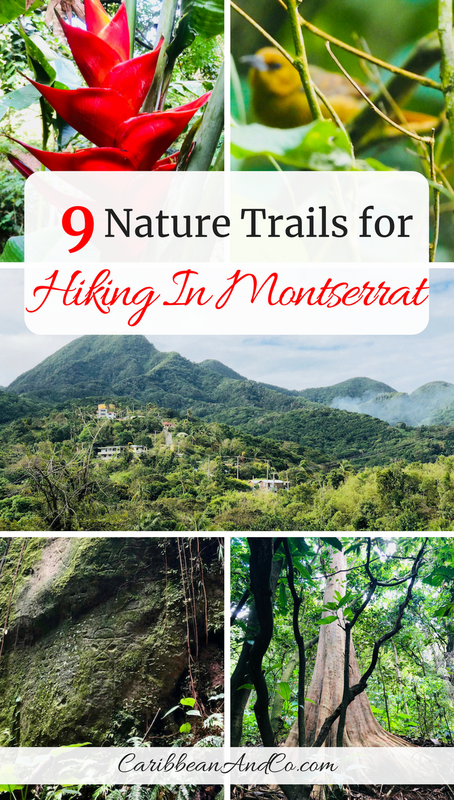 So which of these nine Montserrat nature trails have I explored? All of them except for two including Jack Boy Hill even though I’ve been to the visitor center numerous times to have a look at the destruction caused by the Soufrière Hills Volcano. The other Montserrat hiking trail I have not explored is the Katy Hill Trail System as this is the most extreme but hoping to tackle one or more of its nature trails on my next visit. 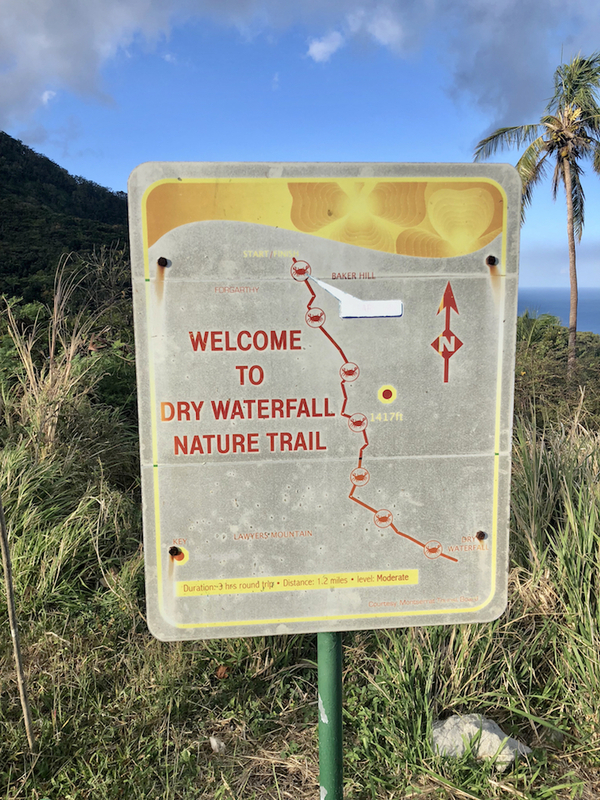 That said, I’ve highlighted three of my favorites including Blackwood Allen, Dry Waterfall and the Oriole Walkway, the most popular Montserrat hiking trail. 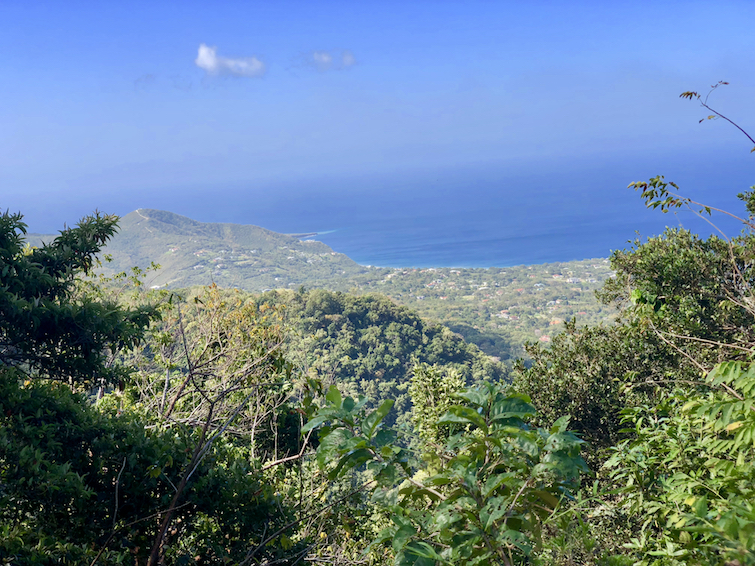 The Blackwood Allen Nature Trail is sentimental for me as the starting point is just above my great-aunt’s house in Mongo Hill a village within St John’s which is in the northern part of Montserrat. 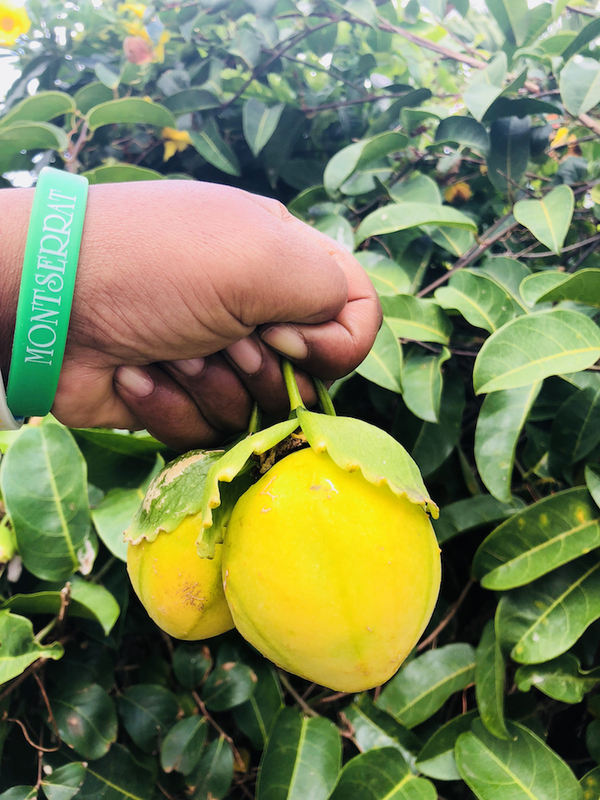 And I have childhood memories of running up the mountain just beyond the starting point of the Blackwood Allen Nature Trail on summer vacations whacking a path with my older sister in search of seasonal fruits like guava, sugar apple, guineps, cashew apple passion fruits, and the mammee apple better known as manciport — all these Montserratian, really Caribbean fruits are so delicious. 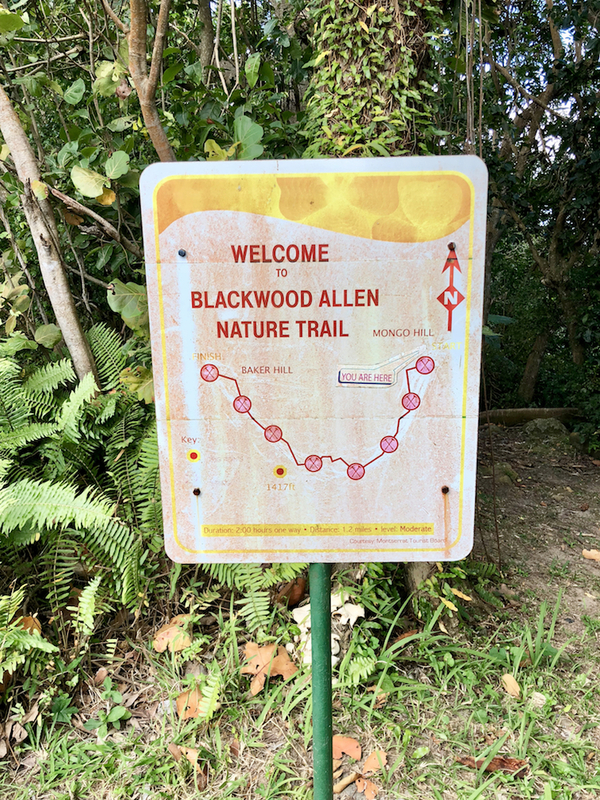 Now, the Blackwood Allen Nature Trail is well marked and follows a series of steep climbs and descents through the Centre Hills rainforest of Montserrat. A few areas can be somewhat tricky especially during the rainy season, and so there are ropes in a few parts to aid the hike. There is an East and West section in the Blackwood Allen Nature Trail, so if you hike the entire instead of diverting midway for the Underwood Nature Trail, you’ll end up in Baker HIll at the start of the Dry Waterfall Nature Trail. The trek to the Dry Waterfall in Montserrat takes about 3 hours round trip to go the 1.2 miles distance. 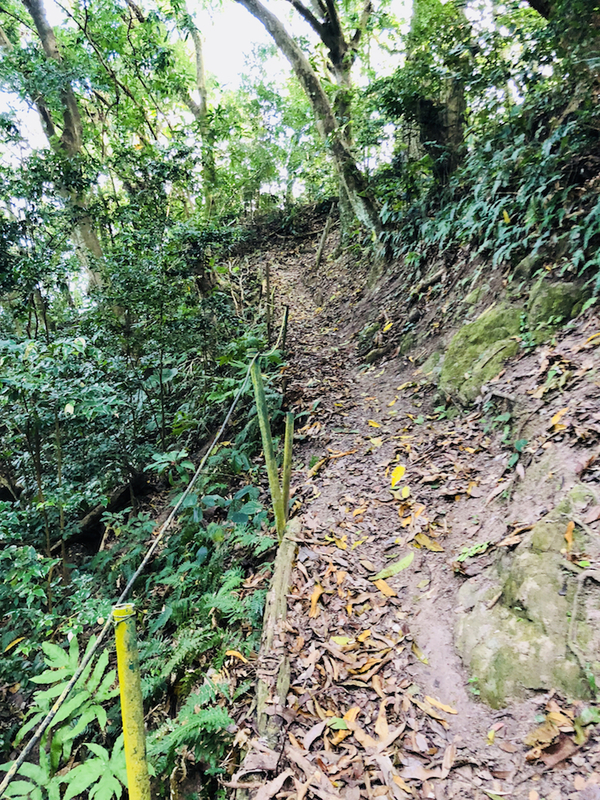 This is because while the trail is moderate and provides an excellent opportunity to see various faunas and birds, it’s often slippery so important to walk with care as dramatic cliffs are rising on either side. As for the waterfall, it is about 100 feet high, but it only runs after heavy rainfalls or during the rainy season. Thus, during this visit as I’d already been to the Dry Waterfall before, I took the opportunity with assistance from my guide Calvin “Blacka” Fenton of Scriber Adventures, to divert midway point in search of the Montserrat Petroglyphs thought to be made by Amerindians over a 1,000 to 1,500 years ago. 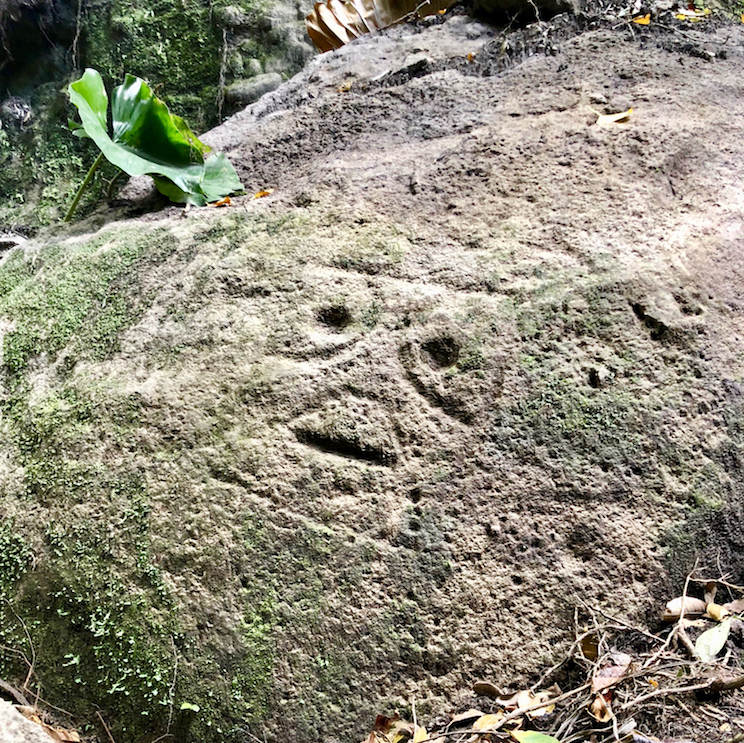 An official trail was not yet built to the Montserrat Petroglyphs first discovered in 2016 by a local hiking group, and so the trek to get to them through bush and mossy rocks was difficult. In fact, but for my walking stick, I would have been sliding down the cliff, well really more of a hillside with thick bush. Once at river level, I trekked with guidance from Blacka over some small and big rocks which were somewhat slippery so had to hike with extra care. 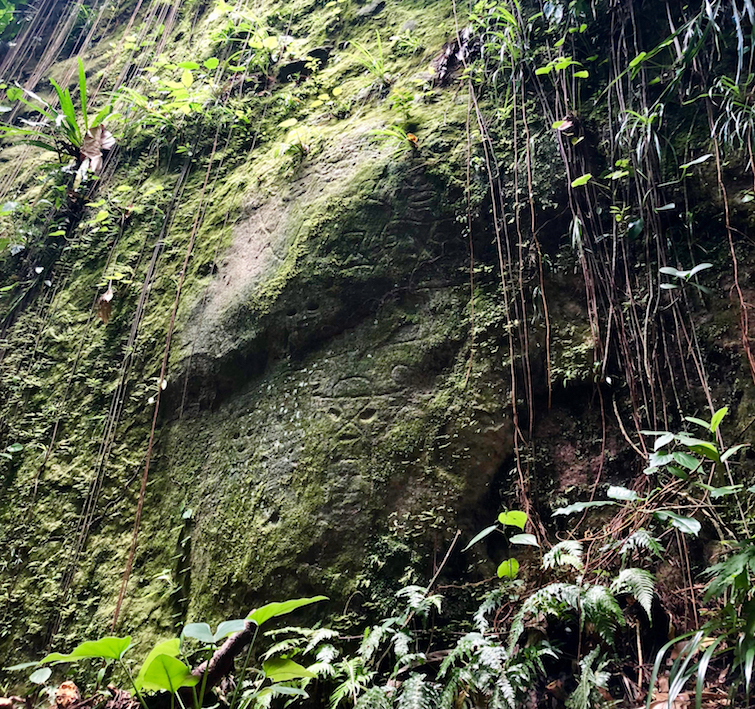 Even with all the difficulty, I would highly recommend the trek to visit the Montserrat Petroglyphs hidden for hundreds of years but now revealed by the washed away green moss and vines. 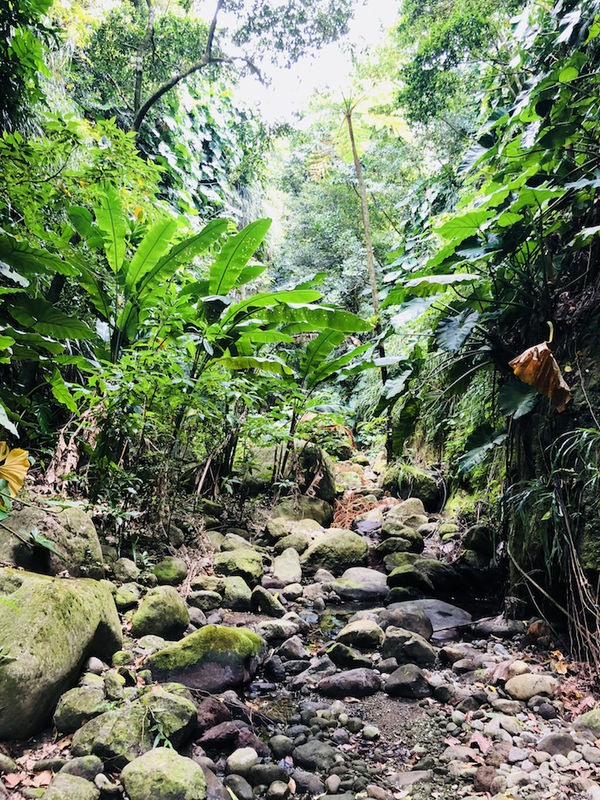 Once we got to the spot which I would never have found without my guide, I stood in near silence just listening to the sounds of the forest with the birds chirping and marveling as the sun beamed through on the now cleared path to the Petroglyphs which will no doubt add to Montserrat’s rich history. Depicting geometric designs as well as human figures, I wondered about the lives of the Amerindians, Montserrat’s original inhabitants who created them. The rough terrain around the Montserrat Petroglyphs in the Soldier Ghaut area would have ensured that their lives were difficult, well at least by modern standards but they were clearly skilled, and good hunter-gathers. 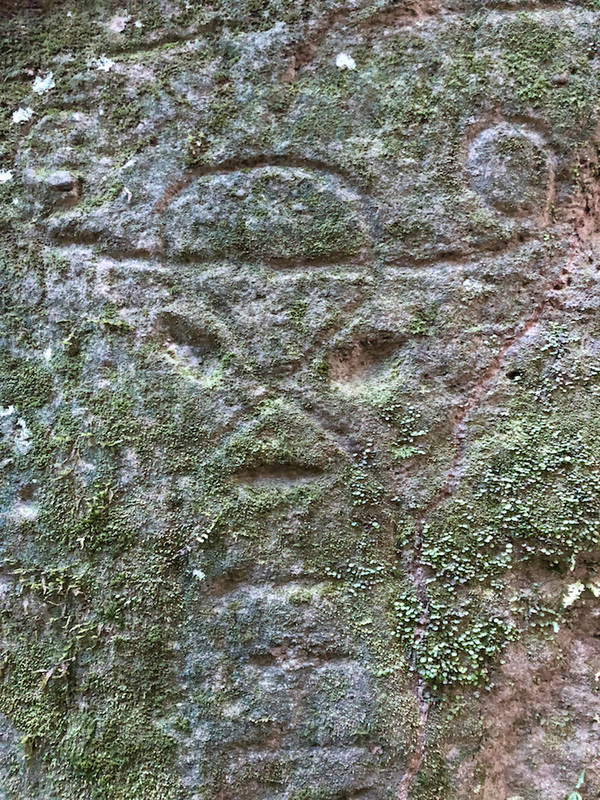 And in years to come, it will be interesting to discover, what hidden meanings may lie within the Montserrat Petroglyphs. 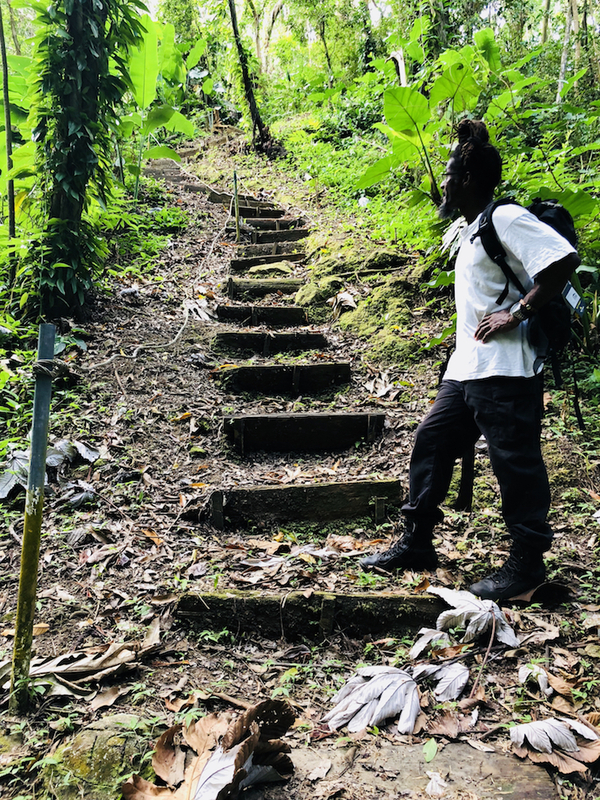 This task falls to the Montserrat National Trust who is currently studying the Petroglyphs and also designing a suitable trail to access the site. 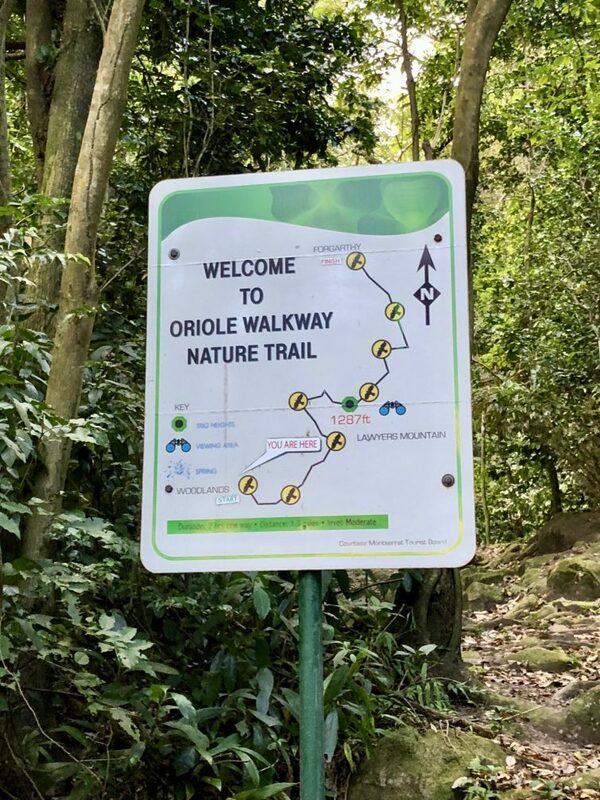 The Oriole Walkway Nature Trail doesn’t have any mesmerizing historical ancient carvings, but it is the more established and popular hiking trail in Monsterrat. 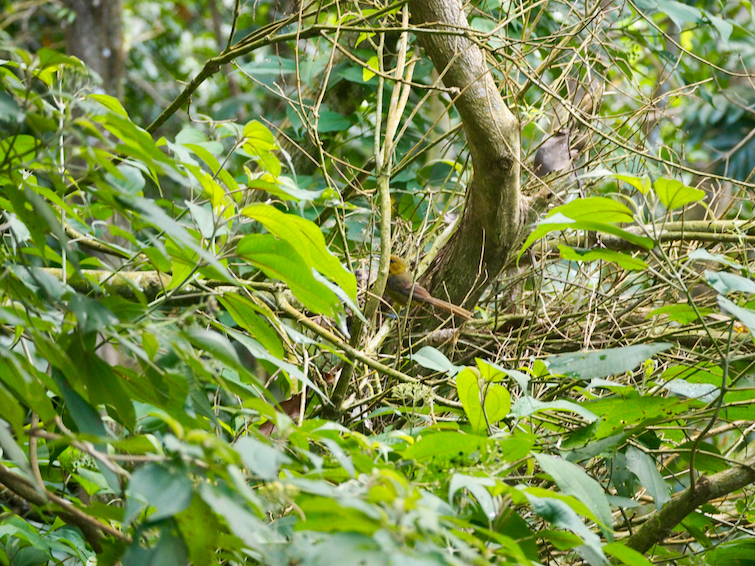 Starting in the Woodlands area, you are likely to hear and see a variety of birds including the Montserrat Oriole, the national bird of Montserrat. Half-way through the hike, you’ll reach the top of Lawyers Mountain which offers up picturesque views of the island including Isles Bay and Garibaldi Hill another great viewing point in the South. In the North, you’ll also get views of the new town Little Bay and Silver Hill which has a near vertical climb up a concrete road. As you descend from Lawyers Mountain, to complete the Oriole Walkway Nature Trail, head towards Forgarthy. 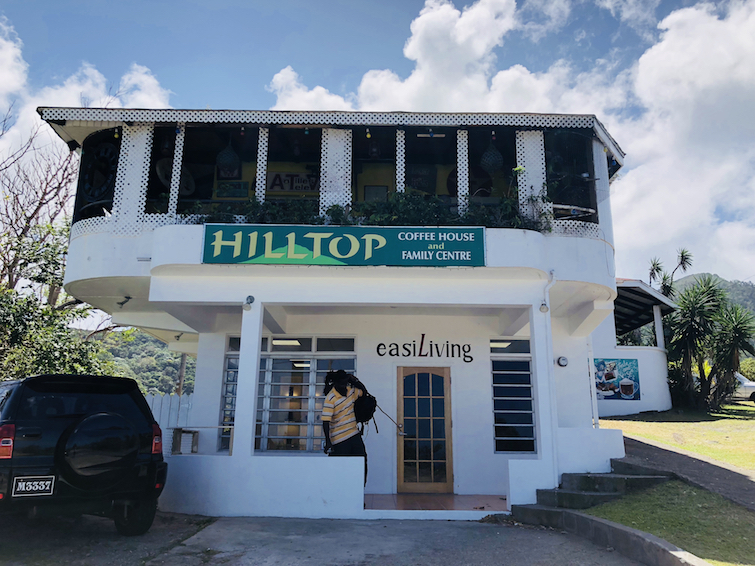 Here you will end up near Hilltop Coffee House & Family Center where you can have refreshments and also look at a fairly extensive collection of Montserrat memorabilia. Downstairs is easiLiving Gallery & FitnesSpa. You can pick up a few souvenirs and even get pampered after your hike. 1. Stopping by the Montserrat National Trust in Salem to pick up a copy of the Montserrat Nature Trails Map. While there, you might also want to get a copy of the book Birding In Paradise: The Caribbean Emerald Isle of Montserrat – A Guide To Bird-Watching, Nature and Heritage Sites. It will provide a lot of insight on the island and of course the nature trails along with detailing the wildlife and plants to be discovered. 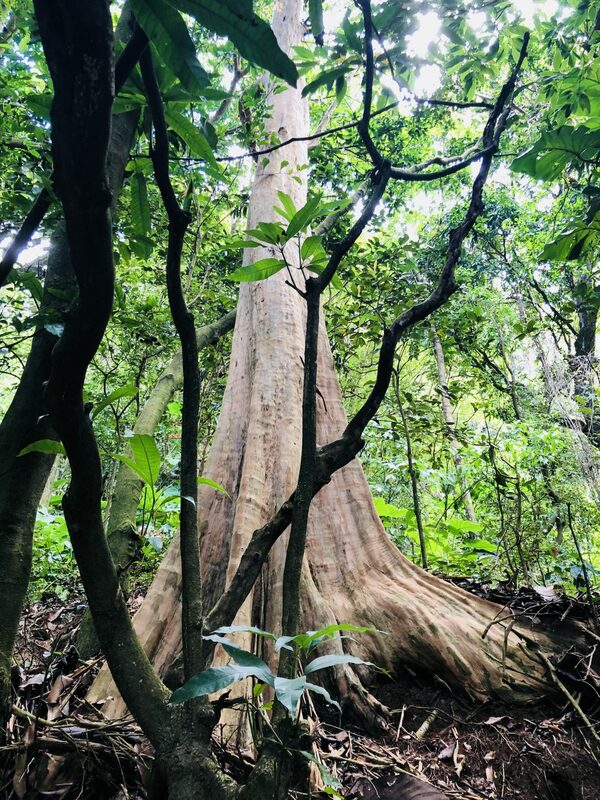 Also, have a look around the Botanical Garden as you’ll get an introduction to some of the flowers and trees you’ll encounter on the nature trails. 2. While the nature trails in Montserrat are relatively well maintained, would recommend booking with a local guide like Scriber Adventures. They know the terrain well and will be able to clear a path if necessary. They can also help keep you safe from insects like the pesky Jack Spaniards wasp that might be hidden under overhanging branches on the nature trail. When disturbed they get agitated and give a painful sting. Also, if you are interested in bird watching, they can help you spot and even make the chirping sounds to draw them out. 3. Chose the right nature trail based on your fitness level. In fact, I’d recommend starting with one or two nature trails that are rated “light” in difficulty. It will give you an introduction to the rugged and oh so beautiful Montserrat terrain. 4. Wear proper hiking gear including hiking boots or sneakers/trainers with good grip and breathable clothing in particular long pants to cover your legs to avoid insect bites, also cuts and bruises from walking too close to the bush. 5. Bring along a walking stick, backpack with a rain jacket, sun hat, sunscreen, one or two water bottles, and snacks to keep your energy up. Granted most of the hikes are short, but as the weather can change quickly in the rainforest including getting very hot, it is vital to stay properly hydrated and fueled. Of course, depending on the time of year, you might get lucky and spot some juicy Caribbean fruits along the way. With that, enjoy your time hiking in Montserrat. There are enough official and unofficial nature trails and black sand beaches across Montserrat to keep you busy for some time.